There's no shortage of holiday events in St. Louis in December, despite the average temperature hovering just above freezing as winter kicks into gear at the end of the month. From Christmas light displays to free holiday celebrations, there are plenty of ways to enjoy the season and mild weather, and when you want a break from the festivities, there are some great non-holiday events, too. However, before you go, there are a few things you should keep in mind when visiting the Gateway City during the last month of the year. From what to pack to typical weather in the region, knowing what to expect can go a long way to ensuring you make the most out of your trip. 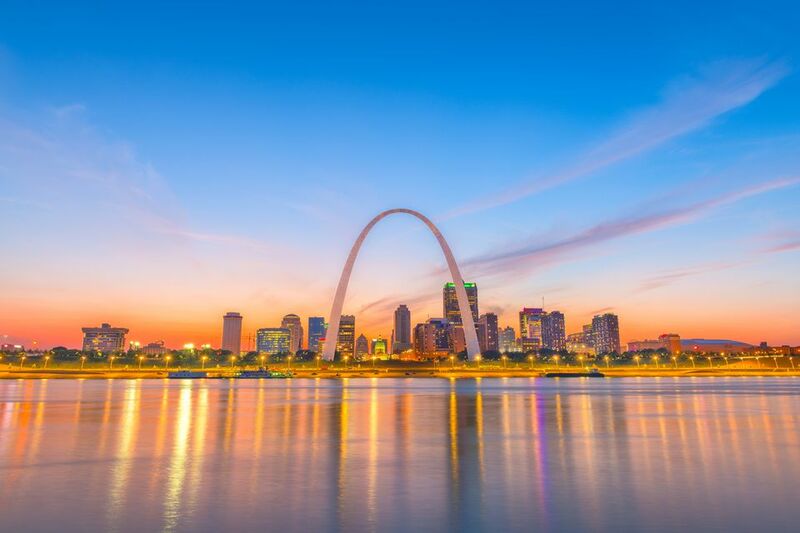 With an average high of 42 degrees Fahrenheit and an average low of 27 degrees, as well as nearly 3 inches of rain and over 4 inches of snowfall throughout the month, December weather can be quite mild in St. Louis compared to other parts of the country. However, precipitation is expected on at least 10 to 15 days of the month and temperatures start to drastically fall around the end of December. Also, with just over nine hours of daylight throughout the month, you may find yourself pressed for time to enjoy attractions and activities in the daytime; fortunately, though, the sun is up early (around 7 a.m.), so if you get an early start, you should still be able to enjoy your day in the city. Since temperatures can be volatile depending on the year (ranging from zero to 72 degrees Fahrenheit and getting as little or as much as zero to 10 inches of precipitation), you'll need to bring a variety of clothing that can be layered for more or less warmth and dryness. A raincoat, umbrella, and waterproof shoes (preferably fit for snow) are essential for the rain and snow, and you'll also want to bring a variety of long-sleeved shirts, sweaters, outerwear, pants, and potentially even thermal undergarments to stave off the cold. You'll find plenty of opportunities to enjoy both festive holiday events and non-holiday celebrations throughout the month of December in St. Louis. Along with a series of concerts, special events for children, light displays, and tree lighting ceremonies, you can also climb aboard "The Polar Express," which departs from St. Louis Union Station for a 45-minute adventure to the North Pole filled with magic, songs, and cheer. Cans Film Festival: Local Marcus Theatres help out the Salvation Army food pantries by hosting this unique film festival each year. Anyone who brings five cans of food to a Marcus Theater can see a holiday movie classic playing that day. All donors will also receive a buy one, get one free voucher to return to see another holiday classic film any day for a designated week in December. Shows at the Fabulous Fox Theatre: In December, you can catch performances of Rodgers and Hammerstein's production of "The King and I," the Nebraska Caravan Theater's production of "A Christmas Carol," The Moscow Ballet's presentation of the "The Nutcracker" and Rodgers and Hammerstein's "Cinderella." MusuemWinter Celebration at the Art: The Saint Louis Art Museum (SLAM) will host a week-long, family-friendly event where visitors can learn about holiday traditions around the world through art, music, live performances, and crafting workshops. Owl Prowls at the World Bird Sanctuary: You can hike through the World Bird Sanctuary in Valley Park to see if you can call or spot an owl on these unique tours, which are hosted on various days from November to March each year. Winter Wonderland at Tilles Park: Open November 21 to December 30 (closed Christmas Day), this is one of the most popular light displays in the city, which has been in operation for over 30 years. Usually, December's weather is cold enough for skiing in St. Louis, and places like the Hidden Valley Ski Resort are busy making snow and grooming the runs for opening day in mid-December. If you're a fan of winter sports, Hidden Valley offers daily skiing plus special events like midnight ski and holiday parties. Although ski resorts don't typically open until later in the month, you may still be able to score some discounts on vacation packages and opening weekend deals. However, rooms are likely to book up fast for the first ski weekend of the season, so you should plan your trip at least a month in advance to avoid being locked out of accommodations. If you're a fan of nature and want a chance to see America's national bird, the bald eagle, December is the begging of bird spotting season in the St. Louis area. Every year, thousands of eagles build their winter nests along the banks of the Mississippi River, and Pere Marquette State Park hosts a Bald Eagle Day in December. Accommodations are more expensive toward the end of the month, so be sure to book your tickets well in advance if you plan to travel between Christmas and New Year's Eve so you can shop around for the best prices. Many local venues will be closed on Christmas Eve, Christmas Day, and New Year's Eve, which means you may have a hard time finding a place to eat out or enjoy your day during the holidays. However, there are still plenty of seasonal events for you to enjoy. No matter when you go, though, you should be sure to check the weather and contact restaurants and attractions before you head out for the day as inclement weather could affect business hours, what you want to wear, and whether or not you want to risk being outside for the day in the first place.